Posted on 05/12/2018 at 2:52 pm. 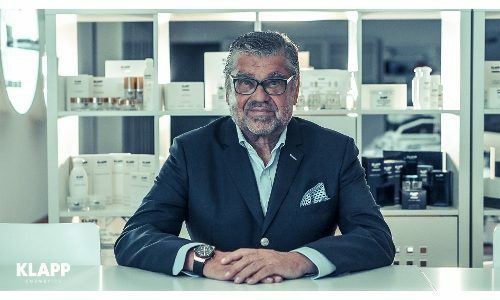 2019 sees Gerhard Klapp, owner of KLAPP Cosmetics, receive the “Life of Beauty” award. Gerhard Klapp is one of the most renowned and popular cosmetics experts in Germany. He is a beauty specialist, innovator, trendsetter, naturopath, entrepreneur, multiple company founder and author. Over the course of his career, he has already successfully established over 18 companies on the market including companies in India, Brazil, Russia and even in the USA. Messe Düsseldorf awards this prize at BEAUTY DÜSSELDORF to honour personalities for their special merits in professional cosmetics and for being driving forces in the industry. The award ceremony will be held at the Meeting Point in Hall 10 at 11.00 am on Friday, 29 March 2019. Gerhard Klapp grew up on his parents’ farm and, after attending adult education college, initially completed an apprenticeship as a wholesale merchant. Klapp entered the world of professional cosmetics quite by chance. At the age of 20 he began training in naturopathy and already began working as a naturopath by the age of 25. He was particularly interested in Dr. Niehans’ live cell therapy. The use of live cells in creams along with his application of Chinese medicine gave him his entry into the world of cosmetics. In search of perfection and driven by ambition, Klapp began to add active ingredients to creams. His alternative methods quickly earned him the recognition of the public and his patients alike. 1980 saw distribution of the first products from the company’s headquarters then located in Ahnatal and from 1990 onwards the firm’s entire corporate strategy was controlled from its new headquarters in Hessisch Lichtenau under the new name “KLAPP Cosmetics” – further companies were then founded such as HEALTH COSMETICALS GmbH or GK COSMETICS GmbH. In 2009 Gerhard Klapp came full circle when the company moved to the former German Armed Forces site in Hessisch Lichtenau. KLAPP Cosmetics of course operates internationally but it is produced exclusively in Germany. “Made in Germany” is a key quality cachet, especially in Asia. The KLAPP brand stands for absolute exclusivity, top quality and scientific expertise. 40 years of experience and continuous research and development of new, high-tech active ingredients and methods always lead to the highest level of treatment satisfaction,” says Gerhard Klapp. Beauticians themselves have always been a focus of his approach: treatment at the beauty parlour is both the starting point and the goal of all KLAPP Cosmetics activities. Gerhard Klapp is one of the most renowned experts in the industry when it comes to trend-setting products and active ingredients in the field of treatments and retail assortments. KLAPP Cosmetics are innovative and highly effective – and it is precisely for this reason that the company and many of its quality products have already been honoured with numerous national and international awards. The 70-year-old has a special passion for cars, fine wine and football. He is a great supporter of local sports clubs and especially youth teams. Gerhard Klapp is far from planning to retire – he is way too active for that and still has all sorts of ideas he wants to realise so as to continue to successfully steer the company into the future. BEAUTY DÜSSELDORF 2019 runs from Friday to Sunday, 29 to 31 March and is open every day from 9 am to 6 pm. All visitors must accredit themselves as trade visitors before purchasing their admission tickets. Visitors can register beforehand at www.beauty-duesseldorf.com. For all other information on BEAUTY DÜSSELDORF also go to the website or call the BEAUTY Hotline on +49 (0)211 4560-7602.